For the Canadian swimmer, see Anne Marie McCaffrey. Anne Inez McCaffrey (1 April 1926 – 21 November 2011)   was an American-born writer who emigrated to Ireland and was best known for the Dragonriders of Pern science fiction series. Early in McCaffrey's 46-year career as a writer, she became the first woman to win a Hugo Award for fiction and the first to win a Nebula Award. Her 1978 novel The White Dragon became one of the first science-fiction books to appear on the New York Times Best Seller list. Dragonriders of Pern is a sci-fi science fantasy series written primarily by American-Irish author Anne McCaffrey, who initiated it in 1967. Beginning in 2003, her middle child Todd McCaffrey has written Pern novels, both solo and jointly with Anne. The series comprises 23 novels and several short stories. Most of the short fiction has been collected in two volumes or incorporated in one of the novels, so Dragonriders of Pern is sometimes identified with the 24 books. 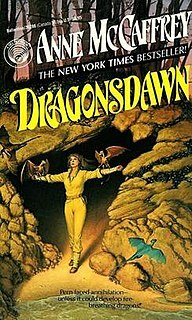 Two of the novellas included in the first novel, Dragonflight, made McCaffrey the first woman to win a Hugo or Nebula Award. Stuart Hall School is a Staunton, Virginia, co-educational school for students from prekindergarten to Grade 12, and it offers a boarding program from Grades 8 to 12. Stuart Hall was founded by the Episcopal Church as the Virginia Female Institute in 1844. It was renamed in 1907 in honor of its most famous headmistress, Flora Cooke Stuart, the widow of Confederate cavalry leader Maj. Gen. J. E. B. Stuart. Wilmington is the largest and most populous city in the U.S. state of Delaware. The city was built on the site of Fort Christina, the first Swedish settlement in North America. It is at the confluence of the Christina River and Brandywine River, near where the Christina flows into the Delaware River. It is the county seat of New Castle County and one of the major cities in the Delaware Valley metropolitan area. Wilmington was named by Proprietor Thomas Penn after his friend Spencer Compton, Earl of Wilmington, who was prime minister in the reign of George II of Great Britain. Regarding her 1969 Decision at Doona (which she dedicated "To Todd Johnson—of course! "), her son recalled that he was directed to lower his voice in his fourth-grade school play when his mother was in the auditorium. That inspired the Doona story, which opens on "an overcrowded planet where just talking too loud made you a social outcast". As a settler on Doona, the boy talker has a priceless talent. McCaffrey also collaborated with author Mercedes Lackey to write The Ship Who Searched, the third of seven books in The Ship Who Sang series by McCaffrey and four other authors, and the only one by Lackey. I started writing s-f in the late 50's/early 60's, when readership was predominantly male. And their attitudes unreconstructed. [... Women] began reading s-f and fantasy—and, by preference, women writers. My stories had themes and heroines they could, and did, relate to. I never had any trouble with editors and publishers. I had trouble getting male readers to believe I was serious, and a good enough writer to interest them. Several of McCaffrey's series (and more than half her books) are set in a universe governed by the "Federated Sentient Planets" ("Federation" or "FSP"). Although Pern's history is connected to the Federation, McCaffrey only used it as a backdrop for storytelling and did not consider her different "worlds" to be part of the same universe. McCaffrey's best-known works are the Dragonriders of Pern series. After colonists from Earth make a decades-long journey to a new planet (which they name 'Pern', from the report of the initial exploration of the planet. Pern is an acronym for "Parallels Earth, Resources Negligible"), a volcanic eruption and an extra-planetary threat called Thread force the original colonists to retreat into caves in the northern hemisphere of the planet, abandoning most of their advanced technology in the process. Adopting an agrarian lifestyle, the survivors of the original expedition create genetically-engineered 'dragons' from a native species of reptiles, and use them to fight back the encroaching thread. The Brain & Brawn Ship series comprises seven novels, only the first of which (a fix-up of five previously published stories) was written by McCaffrey alone. The stories in this series deal with the adventures of "shell-people" or "Brains", who as infants (due to illness or birth defects) have had to be hard-wired into a life-support system. With sensory input and motor nerves tied into a computer they serve as starship pilots (or colony administrators), seeing and feeling the colony or ship as an extension of their own body. They perform this job to pay off their debt for education and hardware, and continue as free agents once the debt is paid. To compensate for the Brains' inability to move within human habitats they are paired with partners known as "Brawns", who are trained in a wide array of skills (including the protection of their Brain counterparts). It was considered impossible for a person to adjust to being a shell after the age of two or three. An exception, in The Ship Who Searched , was a shell-person who was seven when she became quadriplegic. The Ship books are set in the same universe as the Crystal Singer books; Brainship-Brawn pairings were also characters in the second and third volumes of that series. The Crystal Singer series revolves around the planet Ballybran. Under a permanent biohazard travel restriction due to a potentially-fatal symbiotic organism on the planet's surface, Ballybran is the source of valuable crystals that are vital to a number of industries, and home to one of the FSP's wealthiest (and most reclusive) organisations: the Heptite Guild. The Heptite Guild is known to require absolute, perfect pitch in hearing and voice for all applicants (especially those seeking to mine crystal by song). Because Ballybran's weather is unpredictable and dangerous (Ballybran's windstorms will cause exposed crystal to 'scream' in a discordant, deafening cacophony), the Heptite Guild is prohibited from actively recruiting members. 'The Coelura' explores the theme of environmental abuse, as a precious animal is hunted to near extinction for the thread it spins for its net. The Lady Caissa must choose between protecting the Coelura or meeting her obligations to her father and mother. They share a fictional premise, and some characters and events overlap. "Dinosaur Planets" follow the Exploration and Evaluation Corps team on the planet Ireta, which did not expect to find dinosaurs. In "Planet Pirates", all is not well in the FSP: pirates attack the spacelanes. Survivors on Ireta and the survivors of space pirate attacks join forces. Two civilisations in near-identical circumstances – an overlarge, lethargic population and a tragic history with sentient aliens – end up attempting to colonise the same planet by accident. What the humans do not know is that the people they have misidentified as nomadic natives are more technically advanced than themselves (and under no such illusions regarding the humans). The books are set prior to the formation of the Federation of Sentient Planets; in this series, the ruling body is the 'Amalgamated Planets'. This series introduces a new universe with space faring Barque Cats and their special telepathically linked humans. McCaffrey also published two short-story collections, several romances and young-adult fantasies. Her nonfiction work includes two cookbooks and a book about dragons. McCaffrey collaborated closely with musicians Tania Opland and Mike Freeman on two CDs ("The Masterharper of Pern" and "Sunset's Gold"), based on her lyrics and the music described in her Pern novels. ↑ Dragonholder, pp. 8–9. Evidently Merril did not include the story. Judith Merril at the Internet Speculative Fiction Database. Anne McCaffrey at the Internet Speculative Fiction Database. ↑ Dragonholder, p. 98. "A Time When by Anne McCaffrey". NESFA Press. Retrieved 2007-02-08. ↑ Dragonholder, pp. 107–08, 113. Todd McCaffrey explains the reissue as a trilogy and says that the success gave his mother "a secure perch on the ground". With Menolly's story and the white dragon's she was "freed by her dragons". Hans van der Boom calls the painting, "The cover art that, according to Anne and many of her fans, lured many to the shelves of the bookshop to buy ...". "Michael Whelan". Official Pern Art. Art Gallery. The Pern Museum & Archives. Hans van der Boom (2008). Retrieved 2011-07-20. According to a fan report of McCaffrey's address at her SF Hall of Fame induction (2006), "She first thanked Michael Whelan for the cover of White Dragon. ... that's exactly how I came to read Anne ...". "Anne McCaffrey Induction 6/17/06". Becky Coelura MoM Staff. A Meeting of Minds: An Anne McCaffrey discussion forum. Retrieved 2011-07-25. ↑ Whelan identifies his career turning point: "it was when I did the cover for The White Dragon by Anne McCaffrey. It was the first book with one of my covers to make the bestseller lists and 'everyone' noticed." FAQ: Illustration: Early Years. Michael Whelan. Retrieved 2014-02-05. ↑ Pringle does not rank any of McCaffrey's works among the "hundred best" recent English-language science fiction novels or fantasy novels. He concedes a blind spot regarding planetary romance. See Pringle 1985, p. 17. Dragonflight is a science fiction novel by the American-Irish author Anne McCaffrey. It is the first book in the Dragonriders of Pern series. Dragonflight was first published by Ballantine Books in July 1968. It is a fix-up of novellas, including two which made McCaffrey the first woman writer to win a Hugo and Nebula Award. The Crystal Singer, or Crystal Singer in the U.S., is a young adult, science fiction novel by Anne McCaffrey, first published by Severn House in 1982. It features the transition by Killashandra Ree, a young woman who has failed as an operatic soloist, to the occupation of "crystal singer" on the fictional planet Ballybran. The novel is based on short stories written in 1974 and is the first book McCaffrey set in her "Crystal universe". Dragonsinger is a young adult science fiction novel by the American-Irish author Anne McCaffrey. Published by Atheneum Books in 1977, it was the fourth to appear in the Dragonriders of Pern series written by Anne McCaffrey and her son Todd McCaffrey. The Ship Who Sang (1969) is a science fiction novel by American writer Anne McCaffrey, a fix-up of five stories published 1961 to 1969. By an alternate reckoning, "The Ship Who Sang" is the earliest of the stories, a novelette, which became the first chapter of the book. Finally, the entire "Brain & Brawn Ship series", written by McCaffrey and others, is sometimes called the "Ship Who Sang series" by bibliographers, merchants, or fans. The Harper Hall trilogy is a series of three science fiction novels by the American-Irish author Anne McCaffrey. They are part of the Dragonriders of Pern series as it is known today, 24 books by Anne or her son Todd McCaffrey as of summer 2011. They were published by Atheneum Books in 1976, 1977, and 1979, alongside the Dragonriders of Pern series. Omnibus editions of the two trilogies were published by the Doubleday Science Fiction Book Club in 1978 and 1984, titled The Dragonriders of Pern and The Harper Hall of Pern respectively. This is a list of works by American science fiction and fantasy author Anne McCaffrey, including some cowritten with others or written by close collaborators. Sky Dragons is a science fiction novel by the American-Irish author Anne McCaffrey and her son Todd McCaffrey in the Dragonriders of Pern series that she initiated in 1967. Published by Del Rey Ballantine and released July 2012, Sky Dragons is the sequel to Dragon's Time. ↑ Murphy, Caitriona (22 February 2013). "The luxury house 'that dragons built'". Independent.ie. Retrieved 2016-02-03. ↑ Pomerico, D (22 November 2011). "Anne McCaffrey: April 1, 1926 – November 21, 2011". suvudu.com. Retrieved 2011-11-23. ↑ Fox, Margalit (24 November 2011). "Anne McCaffrey, Author of 'Dragonriders' Fantasies, Dies at 85". The New York Times . New York City. Retrieved 2011-11-24. 1 2 3 "McCaffrey, Anne". The Locus Index to SF Awards: Index to Literary Nominees. Locus Publications. Archived from the original on 15 October 2011. ↑ "Damon Knight Memorial Grand Master". Science Fiction and Fantasy Writers of America (SFWA). Archived from the original on 1 July 2011. ↑ "Presenting". Archived from the original on 2006-04-26. Retrieved 2016-08-28. . Press release 15 March 2006. Science Fiction Museum (sfhomeworld.org). Archived 2006-04-26. Retrieved 2013-04-06. ↑ "Science Fiction Hall of Fame". The Cohenside. 15 May 2006. Archived from the original on 2016-10-14. 1 2 3 "Anne McCaffrey 1926–". Science Fiction Hall of Fame (Members). EMP Science Fiction Museum. Archived from the original on 2012-07-22. Retrieved 2011-07-16. Acknowledges content from The Encyclopedia of Science Fiction 1993, 1999; see also its online third edition. ↑ "The Locus Index to SF Awards: 2007 Robert A. Heinlein Award". Locus Publications. 2007. Archived from the original on 2008-07-06. Retrieved 2016-11-21. 1 2 3 "Anne's Biography". The Worlds of Anne McCaffrey. Pern Home. Retrieved 2011-07-07. ↑ "(Anne Inez McCaffrey)". RootsWeb. Ancestry.com. Retrieved 2012-06-16. ↑ Dragonholder, pp. 24, 31. ↑ Sherman, Ted. "Fantasy writer, former N.J. resident Anne McCaffrey dead at 85", The Star-Ledger , 23 November 2011. Retrieved 6 February 2012. "Born in Cambridge, Mass., McCaffrey was raised in New Jersey, where she graduated from Montclair High School." 1 2 McCaffrey, Anne (17 December 2009). "A Letter From Anne". The Worlds of Anne McCaffrey. Pern Home. Retrieved 2011-07-12. ↑ Dragonholder, pp. 10–11, 14, 36–37, 45–46. ↑ Dragonholder, pp. 57–58, 63. ↑ Dragonholder, pp. 5, 68–69, 73. ↑ Dragonholder, pp. 9, 13, 38. 1 2 3 SFFWorld 2000. ↑ McCaffrey, Anne. "Frequently Asked Questions". The Worlds of Anne McCaffrey. Pern Home. Archived from the original on 2011-07-15. Retrieved 2011-07-16. . See questions 2, 10, 17, 19, 22. ↑ Dragonholder, pp. 2, 50. ↑ "Anne McCaffrey – Summary Bibliography". Internet Speculative Fiction Database. Retrieved 2011-11-17. ↑ Dragonholder, pp. 82–83, 95. ↑ Dragonholder, p. 113 (conclusion). ↑ "Anne McCaffrey Named a Grand Master in 2004". Science Fiction and Fantasy Writers of America . Retrieved August 22, 2017. ↑ Dragonholder, pp. 51–52, 54–55. ↑ "Anne McCaffrey (1926–2011)". Locus online. 22 November 2011. Retrieved 2011-11-23. ↑ "The Locus Index to SF Awards: 1987 Locus All-time Poll". Locus. Archived from the original on 2004-01-13. Retrieved 2011-10-12. Originally published in the monthly Locus , August 1987. ↑ Pringle 1988, p. 21. ↑ Pringle 1985, p. 17. ↑ Roberts 2007, p. 5. ↑ "1999 Margaret A. Edwards Award Winner". Young Adult Library Services Association (YALSA). Archived from the original on 2012-01-22. • "Edwards Award". YALSA. Archived from the original on 2012-04-05. • McCaffrey also contributed to the reflections by previous winners that were solicited for the 20th anniversary award, "Looking Back". YALSA. 2008. Archived from the original on 2012-01-30. ↑ Frequently Asked Questions (2007). The Worlds of Anne McCaffrey. Pernhome.com (c) 2010 Todd McCaffrey. Question 21. Retrieved 2011-11-23. ↑ The Ship Who Sang (series). The Internet Speculative Fiction Database. ↑ The Crystal Universe (series). ISFDB. ↑ The Talents Universe (series). ISFDB. Subpages for all constituent stories and books. Retrieved 2011-08-01. ↑ Petaybee Universe (series). ISFDB. ↑ Catteni Sequence (series). ISFDB. ↑ Acorna Universe (series). ISFDB. Clute, John (10 October 2011). "McCaffrey, Anne". In Clute, John; Langford, David. Encyclopedia of Science Fiction (3rd ed.). Gollancz. McCaffrey, Todd (1999). Dragonholder: The Life and Dreams (So Far) of Anne McCaffrey by her son. New York: Ballantine. ISBN 978-0-345-42217-0. Pringle, David (1985). Science Fiction: The 100 Best Novels, An English-language selection 1949–1984. London: Xanadu. ISBN 978-0-947761-10-3. Pringle, David (1988). Modern Fantasy: The 100 Best Novels, An English-language selection, 1946–1987. London: Grafton. ISBN 978-0-246-13214-7. Roberts, Robin (2007). Anne McCaffrey: A life with dragons. University Press of Mississippi. ISBN 978-1-57806-998-9. Karsmakers, Richard (May 1994). "An Interview with Anne McCaffrey". Gouda, NL: karsmakers.net. Retrieved 2011-07-21. Self-published. "Interview with Anne McCaffrey". Science Fiction and Fantasy World. 8 May 2000. Archived from the original on 2011-06-15. Retrieved 2011-07-12. Jamneck, Lynne (2004). "An Interview With Anne McCaffrey". Writing-World.com. Retrieved 2011-07-21. "Anne McCaffrey: Heirs to Pern". Locus. November 2004. Archived from the original on 2011-06-06. Retrieved 2011-07-21. Excerpts from interview published in the monthly Locus , November 2004. Brizzi, Mary T. (1986). Anne McCaffrey. Mercer Island, Washington: Starmont. ISBN 978-0-930261-29-0. Lennard, John (2007). "Of Modern Dragons: Antiquity, Modernity, and the Descendants of Smaug". Of Modern Dragons and other essays on Genre Fiction. Penrith, UK: Humanities-Ebooks. ISBN 978-1-84760-038-7. McCaffrey, Anne (1988). "Retrospection". In DuPont, Denise. Women of Vision. New York: St Martin's Press. ISBN 978-0-312-02321-8. Nye, Jody Lynn; McCaffrey, Anne (1989). The Dragonlover's Guide to Pern. New York: Ballantine. ISBN 978-0-345-37946-7. Roberts, Robin (1996). Anne McCaffrey: A Critical Companion. Westport, CT: Greenwood Press. ISBN 978-0-313-29450-1. Trachtenberg, Martha P. (2001). Anne McCaffrey. Science Fiction Storyteller. Berkeley Heights, NJ: Enslow. ISBN 978-0-7660-1151-9. Wikimedia Commons has media related to Anne McCaffrey . "Anne McCaffrey biography". Science Fiction and Fantasy Hall of Fame.